One of the most common stop errors is – BAD_POOL_CALLER with the value 0x000000C2 In this article we will provide information about this error, the cause and some suggestions for correcting the BAD POOL CALLER error in Windows. This is a blue screen of death error, and like many other BSoD errors, it will crash and reboot your PC to avoid damaging your system. In the case of bad_pool_caller, a thread in your processor made a bad pool request. This means using resources that are not available, that are not available or that are used by another thread. This could also mean that the pool header is damaged – regardless of the error, like most BSoDs, it is caused by driver problems. In the above suggestions did not work for you, you should isolate the physical memory. 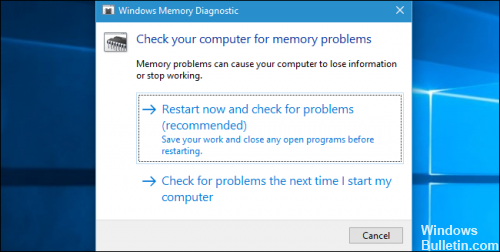 To do this, you can use Windows Memory Diagnostics, another integrated tool of the Windows operating system. You can run the Windows Memory Diagnostics tool to try to isolate the physical memory as a cause. Open it and select Restart now and check for problems. The computer restarts immediately and checks if there are any problems in the physical memory. Once the test is complete, you must open the Event Monitor and display the memory diagnostic results in the system log. 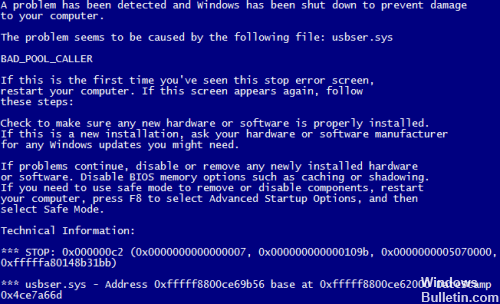 One of the reasons for this blue screen error may be the last changes you made to your system. If you have recently added new hardware or software to your system, remove it to see if the problem is solved. Press Windows + I > click Change PC Settings. Under Refresh your PC without affecting your files, click RecoveryClick Get Started and follow the instructions to update your Windows installation. Turn off your PC by holding down the power switch, then wait and press again to turn it back on. When you see your PC manufacturer’s logo, turn off the PC. Repeat the process until a pending request message appears. On the next screen, select Troubleshooting, then Advanced > Startup Settings. If your PC restarts this time, you can choose how to start it. Select the last known good configuration. Make sure your drivers are up to date. Select the Start button, then type the driver in the search box next to Start. Select Update Device Driver from the list of results. From Device Manager, select Action > Check for Hardware Changes. Restart your PC by selecting the Start button and choosing Power > Restart. BAD_POOL_CALLER Blue Screen of Death error can cause many stability problems, but you can easily fix this error by updating your drivers or removing the problematic software from your PC.